*Click on the image to see in a larger scale. 2015 Eastern Economic Association Annual Meeting, New York City, February 26-March 1. AFEE/ASE/URPE are co-organizing special joint sessions at the 2015 Eastern Economic Association meetings in honor and memory of our friend and colleague Professor Frederic Lee. The meetings will be held in NYC, February 26-March 1, 2015. We invite individual papers and complete sessions for these sessions. 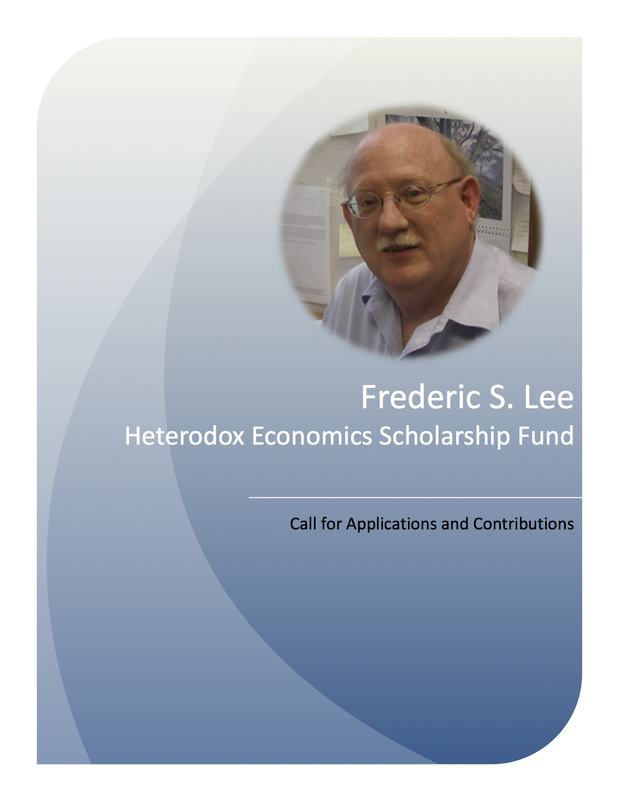 Fred Lee’s contributions to heterodox economics was vast, spanning from price theory, heterodox microeconomics, heterodox microfoundations of macroeconomics, history of heterodox economics, production theory, critical realism, and grounded theory. The deadline for proposal submissions for these special sessions has been extended to November 21, 2014. Please submit your paper or session proposal to Michael J. Murray (mmurray@bemidjistate.edu) and Robert Scott (rscott@monmouth.edu). Please indicate at time of submission that you would like your paper/session to be included in the Fred Lee special sessions. 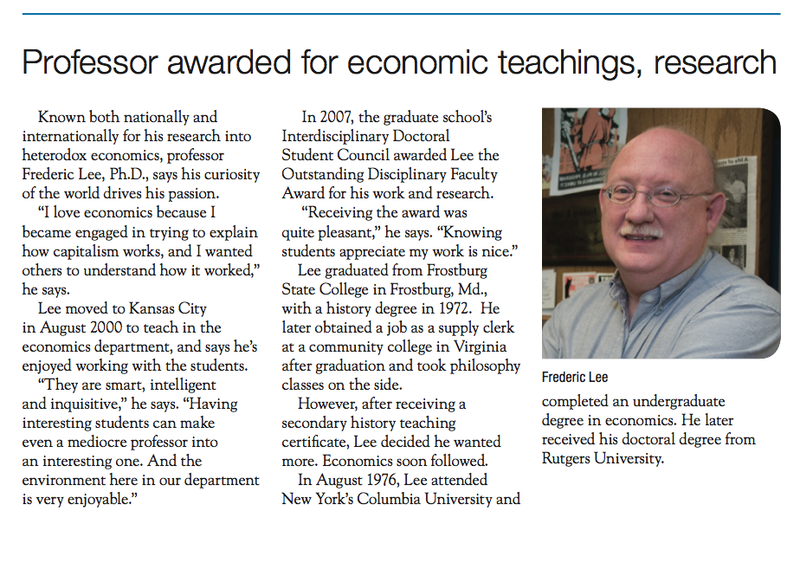 Professor Frederic Lee has been an active promoter of heterodox economics movements over the past 30 years with a major institutional contribution towards the development of heterodox economics in United Kingdom. 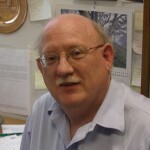 He played a major role in establishing the Association for Heterodox Economics, founded and edited the Heterodox Economics Newsletter, edited the American Journal of Economics and Sociology, has been actively involved in heterodox associations such as AFEE, AFIT, AHE, ASE, EAEPE, HES, ICAPE, URPE, and so on. This event will celebrate his activities towards establishing a truly heterodox and pluralist community of economists and not least his theoretical contributions towards developing foundations for heterodox economics. 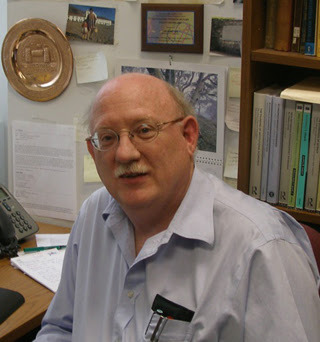 Fred and his wife, Ruth, have recently established the Heterodox Economics Scholarship Fund, which is designed to financially support doctoral heterodox economics students. 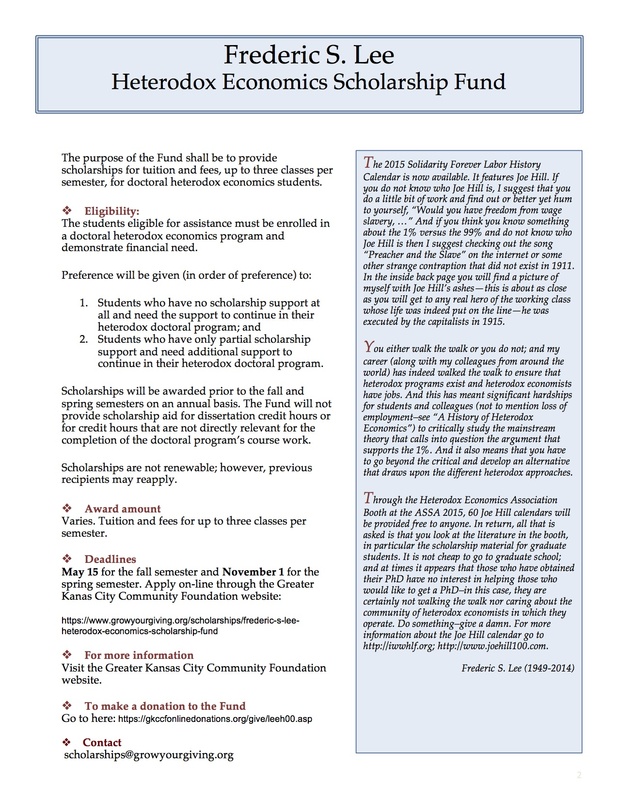 The Scholarship is open to all doctoral students studying in a heterodox economics program, although currently preference is given to UMKC doctoral students due to the limited amount of funds. Thank you all for purchasing books and journals. 962 books have been sold. The book and journal sale is now closed (June 13, 2014). Help established Ruskin College and got Ruskin students admitted to the Diploma of Economics where they were taught reasonable economics as opposed to Marxian economics which they were apt to get some of at Ruskin. Were involved in the Workers Education Association, in the establishment of the Barnett House for social studies at Oxford (that is for the study of the major social issues of the time), and in the living wage movement in the 1920s. Finally they established The Economic Review, the first economics journal in the UK before Marshall and the Economic Journal. Ball, Oona Howard. 1923. Sidney Ball: Memories and Impressions of ‘An Ideal Don’. Oxford: Basil Blackwell. Craik, William W. 1964. The Central Labour College 1909 ‑ 29. London: Lawrence & Wishart. Jones, Peter d’A. 1968. The Christian Socialist Revival, 1877 ‑ 1914. Princeton: Princeton University Press. Kadish, Alon. 1982. The Oxford Economists in the Late Nineteenth Century. Oxford: Clarendon Press. Kadish, Alon. 1989. Historians, Economists, and Economic History. London: Routledge. Koot, Gerard M. 1988. English Historical Economics, 1870 ‑ 1926: The Rise of Economic History and Neomercantilism. Cambridge: Cambridge University Press. Oxford and Working‑class Education. 1909. Oxford: University Press. Lee, F. S. 2009. A History of Heterodox Economics. London: Routledge. There is also another thread in this discussion concerning the reasonableness of Marshall’s economics as represented in his Principles of Economics. As far as economists in the UK (except for those deviants in Oxford) and the US were concerned in the period 1900 to 1920s, the Principles was economics; and they meant by this the supply and demand engine Marshall developed in the book. Of course some people did not like that engine and preferred his more descriptive analysis of how industry and enterprises worked—and there are insights in these discussions. However, these people emerged in the 1920s and after and were considered minor Marshallians, such as D. H. MacGregor. And of course, this recognition of this side of Marshall did not really occur until the 1980s. This is an important note, because the non-neoclassical side to Marshall was recognized by P. W. S. Andrews (through his association with MacGregor) in the 1940s [see The Economics of P. W. S. Andrews: A Collection (edited with Peter E. Earl), Oxford Economics and Oxford Economists, my Post Keynesian Price Theory, and “David H. MacGregor and Industrial Economics at Oxford, 1920 – 1945.” In Marshall and Marshallians on Industrial Economics, edited by T. Raffaelli, T. Nishizawa, and S. Cook], the question is why is not Andrews recognized like Marshall. Andrews certainly spent more time observing enterprises and what they do, not to mention how cartels worked, and even presented testimony on resale price maintenance for books (which was successful)—Andrews had a far superior understanding of industry than Marshall or any other economist circa 1950/55. The reason for his exclusion is that Andrews recognized that Marshall supply and demand engine was faulty to the core and refused to use it. It is because he rejected Marshall’s theoretical engine that he is ignored, since those who like the evolutionary Marshall and the enriched Marshall supply and demand stories do not reject the engine. 1. economics only deals with relatively scarce things. 6. incoherent long period market supply curve; incoherent short period analysis of markets, especially when the representative firm sets a price that is off the supply curve when the price is below minimum average total costs. 7. and finally Book 6 is incoherent (which has been known almost from the time it was written. So this raises the real question of whether there is anything in Principles? After all the supply and demand engine is very neoclassical and also very theoretically incoherent—and this fact cannot be escaped. So somehow thinking that teaching Marshall in the period 1890-1920s-1930s was something great because it would be more interdisciplinary simply do not get it. The theory was incoherent and it was designed to support the status quo; and it was explicitly used to attack, reject, and inoculate students against Marxism (see my book on the History of Heterodox Economics)—students who wanted something different (that is Marxism) were treated badly just like students today who want something different. If you think that teaching in the period 1890-1920s-1930s was really great, I suggest that you actually look at what was taught and what a lecturer had to teach (they were highly controlled), and whether you could deviate (which you could not)—do not think that the past was rosy; my investigations such that this aspect of economics has not changed in the last 125 years. Do you teach something that is theoretically incoherent so that you can be more interdisciplinary? I teach Principles to give my students an idea of neoclassical microeconomic theory developed in the 20th century; and as long as this understanding is necessary to be a good economist, I will continue to teach it. However, I do not teach it to give students a good theoretical understanding of how the economy works—it does not; and nor do I teach it to be interdisciplinary. If you believe that Marshall’s supply and demand engine provides some good theoretical insights of how the economy works, then become a neoclassical economist. On the other hand, you can, like Andrews, completely drop Marshall’s supply and demand engine and try to build an alternation heterodox microeconomic theory. This is very hard to do; and you will be attacked (like Andrews) by the mainstream because you question their core set of beliefs/theory. Of course you will not be a respectable economist. The following papers were obtained from Mrs. Meek circa 1998. The originals remain with Mrs. Meek. Ronald Meek was a professor at the University of Leicester when he died; and it appears that all of his papers were destroyed at this time. At least I could not find any. In any case, I was teaching at De Montfort University at this time and was beginning to work on the history of heterodox economics, which was eventually published in 2009. Because Meek was part of this history I contacted Mrs. Meek to see if she had any papers. She did, but not very much, and mostly from the 1970s. I hope you find what I obtained from Mrs. Meek of interest.